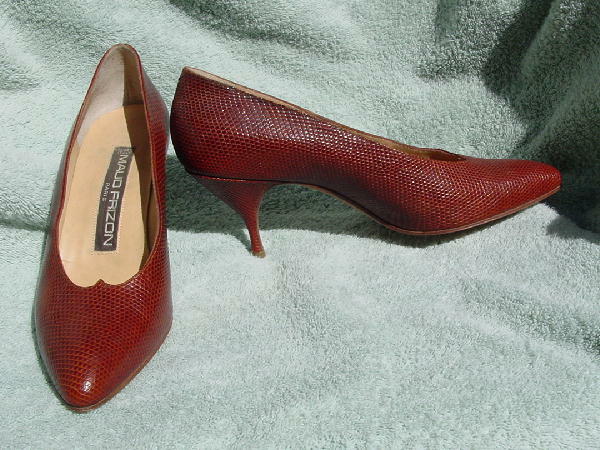 These never-worn multi-tone brown reptile pumps are by Maud Frizon Paris and were made in Italy. They have leather soles and light tan insoles and leather linings. At the base of the vamp is a cutout small V.
They have a cute feminine heel. The right outer side of the right shoe has 2 scuff marks. They probably happened when they were packed in the suitcase. They're from a French model. She paid $300 plus tax for them, but didn't try them on in the store. She wasn't wearing her glasses and thought she bought size 39. When she got back to France, she realized they were the wrong size.